Today gardeners use tree ferns, tussock grasses and some of the hundreds of varieties of hebe to create fascinating gardens. But for a long time native plants were seen as drab. Apart from some spectacular exceptions, native plants don’t have showy flowers. In the 1970s and 1980s, interest in natives bloomed. Early Māori tribes grew plants that they had brought with them from the Pacific as well as some New Zealand natives. They grew rengarenga lilies to eat their fleshy roots, and planted karaka trees around their villages for their orange berries. Although karaka fruits are poisonous, Māori knew how to process them so they were safe to eat. One of the first things European settlers did was clear native bush and plant European grasses. For a long time native plants were often seen as boring, or hard to grow. People in Britain were more interested in growing New Zealand native plants than New Zealanders were. British people liked common New Zealand plants such as cabbage tree because they seemed exotic. There were always some people who loved native plants. J. G. McKenzie, who worked in Wellington’s parks department, planted so many pōhutukawa trees around the city that he was known as ‘Pōhutukawa Mac’. In the 1970s and 1980s, people began to realise that they could make interesting gardens with natives. Today native plants are very popular because they are easy to grow and have interesting shapes and foliage. Tecomanthe speciosa is a climbing plant with big, glossy leaves and bunches of cream, bell-shaped flowers. 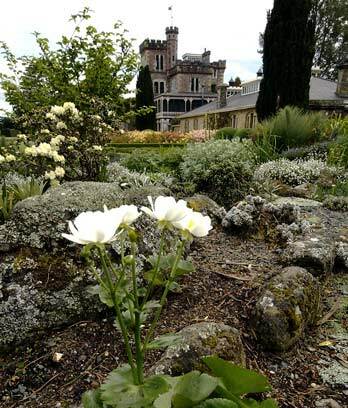 It grows well in Auckland gardens, but only one plant survives in the wild, on a remote island in the Three Kings group. The only native plant that is still grown for food is New Zealand spinach or kōkihi. It has arrow-shaped leaves and is grown as a novelty vegetable.